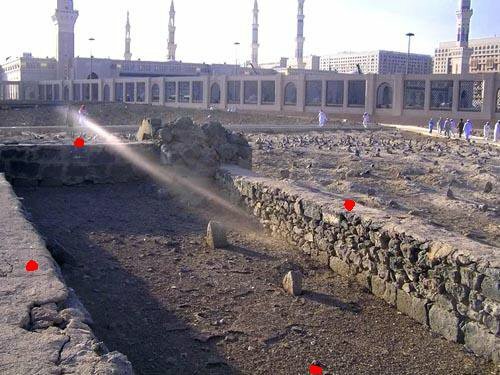 THE Graves of the al-Harrah martyrs ARE HERE in the grave yard of jannat ul baqee. Alharrah Battle (683 CE) is a battle fought at al-Harrah and inside City of Madinah between the Umayyad army commanded by Muslim bin Uqbah and people of Madinah as a reaction to Madinites decision to expel the Umayyad Governor of Madina appointed by Yazid ibn Muawiyah (The 2nd Umayyad Caliph). The Syrian army looted the city for three bloody days. Muslim bin Uqbah was henceforth known as Musrif meaning he who exceeds all bounds of propriety and offended women and the girls. DURING THIS BATTLE SALAT ------ PRAYER---------COULD NOT BE OBSERVED THREE DAYS IN MASJID NABVI SHAREEF.